Can I Buy a Domestic Walking Foot Sewing Machine? What Are the Benefits of Buying a Walking Foot Sewing Machine? How to Maintain a Walking Foot Sewing Machine? Walking foot sewing machines are often used for advanced stitching. Also known as a quilting foot, a walking foot sewing machine guides multiple layers of fabrics through the sewing machine. In this blog post, we will inform about the walking post sewing machine. You will know the use of the walking machine and how it’s different than traditional sewing machines. Also, we will list the best walking foot sewing machines that are currently available in the market. The walking foot sewing machine will literally ‘walk’ with the material. As a result, the top portion of the material won’t stretch as much. In comparison, a traditional sewing machine will slightly pull the top portion of the fabric. The purpose of the walking foot is to prove extra support for sewing the top of the fabric. This makes it easier to sew a range of fabrics that is not possible with a traditional sewing machine. With a walking foot sewing machine, you can sew matching plaids and other complex designs. The knits will flow through the machine without any problem. Silky fabrics won’t slide when sewing, making the job easier. 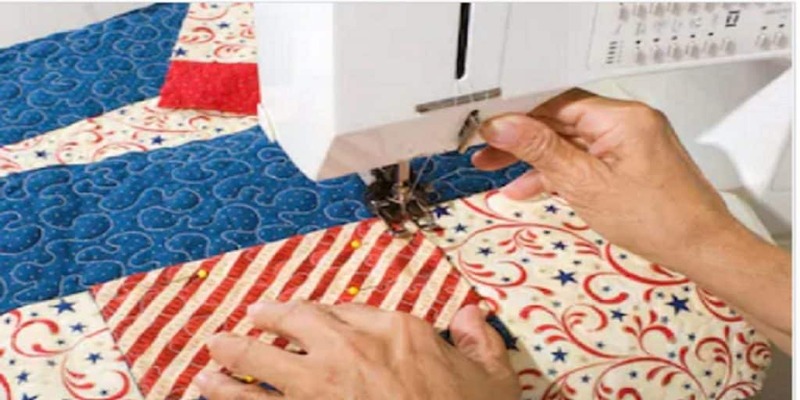 You can easily complete projects like sewing quilts without much problem. The feet of the walking foot sewing machine look different than a traditional machine. The machine is bulky and has a separate arm that connects to the needle bar. The extra bar allows the sewing machine to pull the top and bottom of the fabric at the same rate. When you use a walking foot sewing machine, the foot of the sewing machine evenly feeds the batting, backing, and quilt top. This makes it best for quilting curves on knit or slick fabrics. You can buy domestic and industrial walking foot sewing machine. In addition, you also add walking foot as an attachment to a domestic sewing machine. But it won’t perform the same as walking foot sewing machine. Walking foot attachments, also called plaid matchers, can’t duplicate the movement of a walking foot sewing machine. As a result, sewing machines with a walking foot attachment can’t compete with walking foot sewing machines. Now that you know what a walking foot sewing machine is, the next question is when you should dish out extra money to buy one. Here are some of the situations when you will need to buy a walking foot sewing machine. If you want to stitch thick fabric like cotton— A walking foot sewing machine can easily climb over thick material without getting stitch. 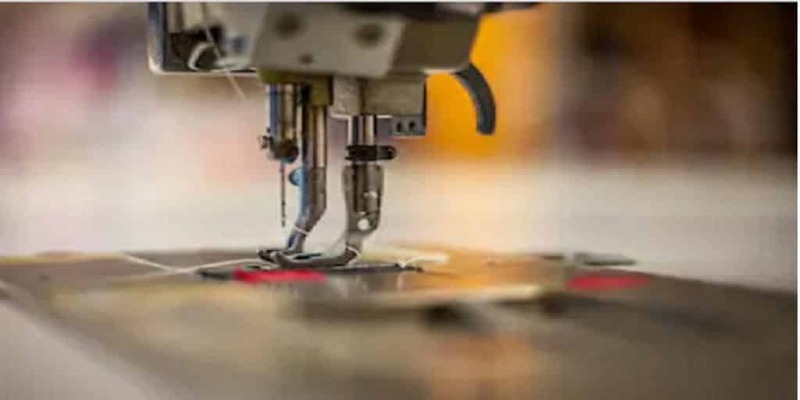 You want to stitch a large number of clothes for commercial purposes — A walking foot sewing machine can stitch multiple layers of thick This can save time in stitching clothes. When you need to keep material and pattern in place —With a walking foot machine, you don’t have to pin the material together. The sewing machine can feed evenly resulting in limited slippage when sewing. It keeps the material and pattern in place when sewing. You have quilt binding to stitch — A walking foot machine will make it easy to sew on quilt binding or mini-quilt binding. The machine will prevent the top layer from pushing ahead of the layer beneath thereby preventing insecure binding, pleats, and puckers. If you want to work on straight line quilting — Another benefit of a walking foot sewing machine is that it works best for straight line quilting. The sewing machines keep together the layers and prevent the top layer from shifting ahead of the bottom layers. This prevents the formation of tiny pleats and puckering when the quilted lines direction is changed. You can use the walking foot machine for sewing tote bags, mini-quilts, basket, and more using the sewing machine. When you need to sew straps using a sewing machine — If strange ripples appear down the straps, the most probable reason for it is due to switching in the wrong direction. Using a walking foot sewing machine will prevent the problem. You want to sew on stretch fabrics — A walking foot sewing machine allows you to sew on stretch fabrics. These machines are must in upholstery projects. A walking foot machine requires special care. You should clean the sewing machine regularly to keep it free of dust. To clean the sewing machine, you can use a small vacuum and a swab of cotton. You can also take your sewing machine to a professional dealer to get it cleaned. You should not just buy any walking foot sewing machine. You will waste money if you buy a low-quality machine. While a lot of walking foot sewing machines are available on the market, only a handful meet the quality criteria. To make the selection process easier for you, here we have reviewed three branded walking foot sewing machines that offer great value for money. JUKI DNU-1541 Industrial Walking Foot Sewing Machine Price: $1,699.00 "Fantastic work horse. I can't believe my workroom went so long with out it." 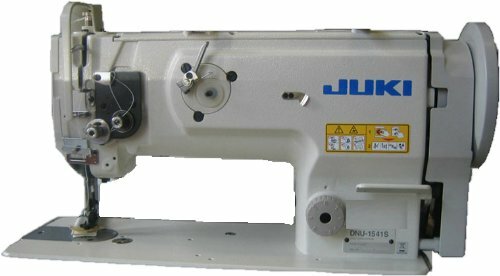 Juki DNU-1541 is an industrial walking foot sewing machine. The straight stitch, the single needle sewing machine is made by the reputable Japanese brand Juki. Juki along with Singer, Brother, and Janome are considered the best sewing machine brands. The company produces the best quality industrial sewing machines. This walking foot sewing machine is ideal for stitching heavyweight fabrics. The sewing machine features rectangular feed and higher needle stroke. You can easily sew thick fabrics such as cotton and leather with this machine. The sewing machine is sold as a complete unit. The unit comes with a machine table, head, motor, sewing light, and stand. All the necessary components that are required to sew thick fabrics are built in and ready to sew. The machine can sew an amazing 2,500 stitches in a minute. You can use the industrial grade sewing machine to make dozens of clothes in a day. This machine also supports wider stitching length. Most top of the range of domestic sewing machine support 5mm stitch length. However, Juki DNU-1541supports 9mm stitch length. One of the best features of the sewing machine is the power safety feature. The safety feature will engage automatically once an error is detected. This will prevent further damage to the unit. The design of the walking foot sewing machine makes it easy to stitch very thick fabrics. The machine also makes less noise when stitching comparable to the best industrial sewing machines. While the cost of the sewing machine is high, the quality features make it more than worth it. The performance of the walking foot sewing machine is first class. The sewing machine will work flawlessly without breaking down. Here’s a highlight of the important features of this walking foot sewing machine. Janome MC-6300P is a heavy duty walking foot sewing machine. The sewing machine is available at nearly half the price of Juki DNU-1541. The sewing machine speed of 1,000 stitches per minute is adequate for most people. This walking foot sewing machine allows advanced sewing due to its power, speed, and precision. The sewing machine consists of a large number of features that can allow you to quickly and easily stitch thick fabrics. Time-saving features include the automatic thread cutter. The thread cutter also has built-in memory function with programmable memory recall. Moreover, the sewing machine has a low bobbin thread indicator. The machine winds the bobbin automatically using a separate meter. So, you don’t have to unthread the machine to wind a new bobbin. The sewing machine has a lot of features such as five different blanket stitches, throat space for large quilts, and a hank look quilt stitch. This makes it particularly ideal of quilting and sewing thick materials. This machine also has a knee lifter that can be used for lifting the presser foot. 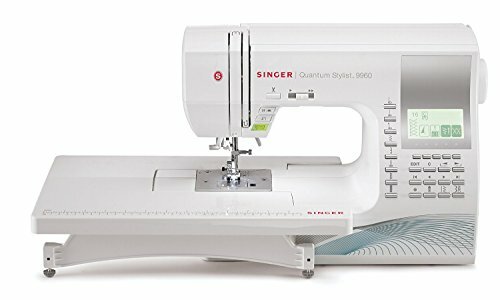 Singer Quantum Stylist is another great walking foot sewing machine that cost a fraction of the price of the other two machines reviewed here. Despite the lower price, the sewing machine can sew thick fabrics at a decent rate. This makes it one of the best value walking foot sewing machines available on the market. The sewing machine has 600 built-in stitches. And no this is not a typo. You can stitch just about any pattern with the walking stick sewing machine. The machine also supports 5 different alphanumeric fonts. The feature will come in handy in a custom embroidery project. But that’s not all. The sewing machine also supports editing capabilities. This allows you to select the exact location of the stitch pattern. The sewing machine can stitch leather and other thick fabrics effectively. The top crop-in bobbing system and automatic needle threader can save time in setting up the machine. The results of this machine will be better than expected and offer much value for money. Apart from leather, you can use Singer 9960 Quantum Stylist to work on regular materials without any problems. The sewing machine has electronic speed controls. You can stitch a variety of materials easily without any issues. You can move from one task to another quickly due to the automatic thread cutter. The cutter will trim the threads with one-touch once you are done. This is a great time saver when stitching multiple items in a day! The larger than average sewing space also facilitates getting larger projects done in less time. We recommend the sewing machine if you don’t want to spend a lot of money for a walking foot sewing machine. Make sure that you buy a reputable brand walking foot sewing machine. You should look for a sewing machine with reverse function. Also, you should ensure that it’s a real walking foot sewing machine. Some sellers sell traditional sewing machine with a walking foot add-on. As mentioned earlier, the add-on doesn’t provide the same performance as a true walking foot sewing machines. In fact, trying to use a traditional machine on thick fabrics may cause irreparable damage not covered in the warranty. In addition, you should check what features are supported by the sewing machines. Some machines like the Singer Quantum Stylist 9960 doesn’t support the use of quilting bar with the walking foot. You should read the reviews about the sewing machine to know features that are not supported in the machine. In addition, some models are suited for upholstery while others for drapes. Sewing machines that can work on upholstery generally are more powerful and pricey. So, you need to carry on proper research to ensure that the sewing machine can adequately stitch the required fabric. You should shop around and read reviews such as ours before buying a walking foot sewing machine. This is important since they are a major purchase and cost a large sum. Properly researching about the best walking foot sewing machine will increase the chances that you buy the right machine that meets your needs.